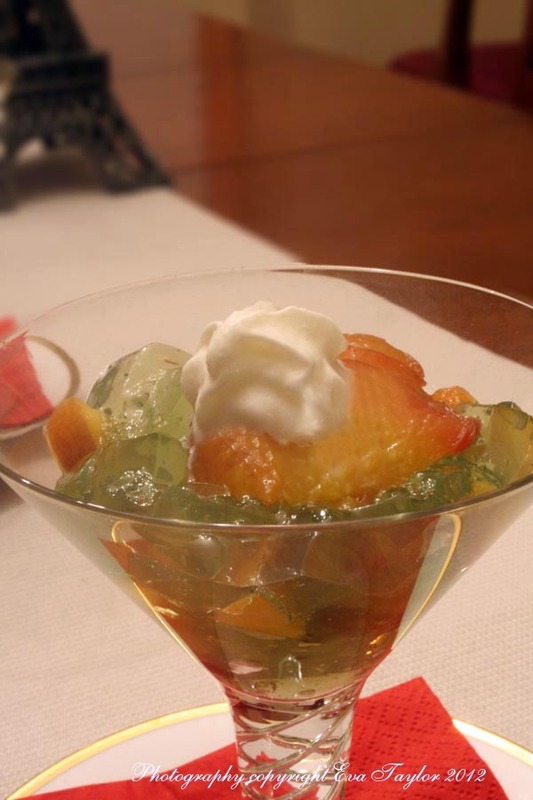 Continuing on with my short series of First Class Titanic dishes for my good friend Angela’s party, I am tackling a simple dessert of Peaches in Chartreuse Jelly. Now to my modern sensibility I read this dessert title and thought, “What the heck? Jello for dessert in First Class?” Let’s rewind to the early 1900’s to clarify: this was well before the advent of instant gelatin, making gelatin based desserts was labour intensive and time-consuming (let’s just say that there are tendons, ligaments and connective tissues involved, click here if you must know). 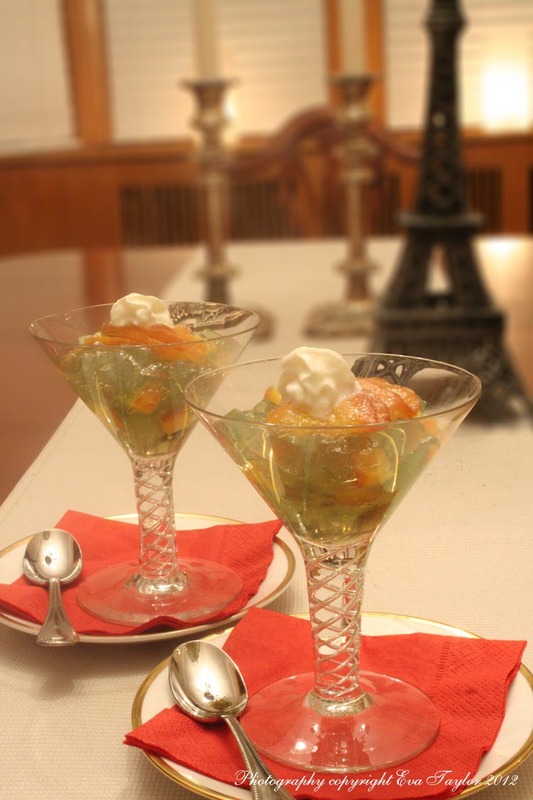 Serving a gelatin based dessert to your guests meant that the meal was a truly special one. What doesn't go well with whipped cream? The description on this recipe says at it combines the sweetness of peaches poached in sugar syrup with the potent herbal essences of Chartreuse Liqueur. Chartreuse is a digestive, sweet with strong herbal flavours (I taste grass), not one of my favourites, I must say, but it did pair nicely with the peaches. Note that the peaches in Toronto are by no way in season at this time; I found it nearly impossible to peel the skin off as per the recipe, I have my fingers crossed that they will behave for the special evening! For the test, I made 1/4 of this recipe which worked out well for two of us. We were both impressed at how tasty it actually was, even though it’s green! Dissolve the gelatin in 1 cup of water. In a small pot, bring the remaining cup to a boil. Add the sugar and stir until it is entirely dissolved. Remove from heat and allow to cool for about 20 minutes. Add the Chartreuse and the gelatin and stir to combine. Pour into a 9″ x 13″ glass baking dish lined with waxed paper; refrigerate until completely set. Tender poached peaches and green jelly. Can you say YUM? Cut the peaches in half and remove the stones. Immerse the peaches in a large pot of boiling water for about 30 seconds; then transfer them to ice water. Slip off the skins. In a large pot, combine the water and sugar; cook over medium heat stirring gently until sugar is dissolved. Bring to a boil and cook for one minute or until syrup is clear. Add lemon juice, cinnamon stick and cloves. Add the prepared peaches making sure they are entirely immersed; cut a piece of parchment slightly smaller than the pot and place over the top of the peaches to make sure the remain submerged. Bring the syrup to a boil and reduce the heat to medium-low and poach the peaches gently for 6 minutes or until soft (they should be easy to cut into with a spoon). Allow the peaches to cool in the syrup. This may be stored for 24 hours in the refrigerator. The syrup that the peaches were poached in are not required for the recipe, but you may reserve it for something else! To serve, turn out the jelly onto a cutting board and cut half into even little squares; the remaining half should be cut into decorative shapes using a cookie cutter. The instructions indicate that you are to plate the cut squares onto the centre of a flat plate, arranging the jelly shapes around the edges, but I have special permission to plate in the way I photographed. I think it is a more sophisticated look. Slice peaches from one end to almost the other, and fan it out onto a bed of jelly. Garnish with edible flowers or lemon balm leaves. Even though the recipe was not as labour intensive as it would have been in 1914, it will still impress your discerning guests; but then again, after 10 course dinner…there is always room for Jell-O! Catching up on posts I might have missed in 2013. This is a grand one indeed. My father was born in Feb 1912 so was a baby when the Titanic went down which always intrigued me for some reason. Wishing you a good 2014 Eva. thanks for your nice comments on the blog. I will try to respond better. Hi Ruth, thank you so much. How interesting to have been born that year, did your grand parents speak much of the disaster? It’s fascinating now but must have been horrific! They did a great job on Downton Abbey first episode that dealt with it. Don’t worry about keeping up comments and responding, it should be fun and not a chore. Life gets busy, we all get it. Thanks for the understanding about the keeping up with responses and you generous words about “getting it” Eva. I will worry less. Or try to. and it was my parents both born in 1912 but my dad was just a baby. I never remember my grandparents (1888 era) saying anything about it. Have you read The Devil in the White City by Erik Larson? If not, download just the sample on a Kindle and the first chapters bring the Titanic to life in a new way for me. Thanks for the link to the book Ruth, I have a friend who is very interested in Titanic stuff, I will definitely let her know. I can’t wait to make this dessert, BUT do I dissolve the gelatin in cold water for step on. And can I prep it the day before and just cut it up the day I am serving? Yes, Yvonne, sorry, I should have been more specific. Gelatin only dissolves in cold water. Absolutely you can prep it a few days in advance and store the jelly in an air tight container in your refrigerator, so it doesn’t dry out. What a light and delicious dessert! Love your elegant serving glasses too! Thank you Angie, the glasses came from my MIL’s wedding china. I am very fortunate to have them! Wow.. this recipe definitely has a vintage feel to it! So many desserts were gelatin back then.. molded or like this in an elegant cup! Sooo pretty! I’m afraid to admit I don’t know what Chartreuse is?? Thank you Barbara, I have to admit, I did not either. It’s a bitter, as they say, it has some herbal notes as well as some grassy notes; if it wasn’t for the sugar in the recipe, it would be gross! If you’ve had Jägermeister, it’s kinda, sorta similar. Now I realy want to know what your decadent dessert taste likes after reading that u throw in Chartreuse into the recipe. I am already a peach nut so.. thats a 100% a recipe I ll love and enjoy! thanks for the awesome share! Thanks for dropping by Helene, the Chartreuse was a lovely addition to the recipe, but I have to say the peaches were absolutely awesome. I’ll have to do them again soon. Oh that’s awful Kay but at least you’ve figured out what you’re allergic to; some food allergies are really difficult to figure out because it may me a specific combo of foods. Thank you very much Caroline; the glass ware comes fry MIL’s wedding crystal! It is so lovely to be able to use it! Thank you kindly Caroline; the glasses are part of my MILs wedding crystal from 1952! Have a great weekend Eva!! I think I can recall something like that myself, Jed! Have yourself a lovely weekend too! Lovely recipe, Eva. I keep saying on my Downton Abbey blog (http://downtonabbeycooks.wordpress.com) that the British loved their jelled desserts, so if you don’t choose an actual item served from that fateful night (The Dinner on Titanic is a great recipe book written by Canadians) pick a great jello dessert like this one. Mrs. Beeton, the original domestic goddess is the perfect place to look. She is very much DIY, but fret not, you don’t have to grind down animal parts, jell-o type products were available to cooks at the time of Titanic. That’s interesting Pam, but the recipe I’m working from indicated that ready made gelatin was not available at that time! My friend Angela surely has Dana’s cookbook, being the titanic buff that she is! Apparently this is one of the desserts served that night (as well as mini eclairs)! Thank you kindly Ann! Even with the ready made gelatin, it was a lot more laborious than the result showed; but it was fun to make! You are really going all out for this party Eva — not that I’m surprized! 🙂 Fingers are crossed that the peaches cooperate on the big day. Thank you, Barbie! So lovely of you to say! Thank you Maraia, the dessert was a lot more labourious than result shows; jell-o with peaches! So I’m hoping the taste will attest to it! The dessert looks so elegant. I love a jelly dessert- sweet but not too heavy. This looks sublime. Thank you kindly Tori, and welcome back. This is an interesting flavour profile and I will be curious if people like it on April 14th. Very cool recipe – it’s interesting to think of desserts and foods like gelatin, that were once considered a treat – but with the advent of technology and mass production – are no longer considered as special. If that makes sense? Anyway – looks delicious! I’m scared of gelatin — gelatin and deep-frying, my two kitchen phobias. Interesting recipe, though. You could probably make it out of frozen peaches since you are cooking them in syrup anyway. I love peaches and I love chartreuse, so I’ll bet this is great. It sure makes an elegant looking dessert! Wow, Betsy, I am impressed! I had never heard of Chartreuse before I was given this recipe! Quite cool indeed! Thank you so much Betsy! I am flattered and honoured. I have to say Eva, this dessert looks positively gorgeous! What a presentation… I don’t find myself eating jello all that often 😉 (my initial reaction is a bit like yours) but how cool to learn about the history of gelatin – and it makes entire sense that this would be a luxury – I bet it tasted wonderful in this mix and it’s so darn pretty too! Thank you kindly Kelly. I usually don’t eat jell-o because of the sugar content and the sugar free versions are just full of chemicals, but having made this, I can certainly see how I can interpret it with juices and fresh fruits instead of sugars. Thanks Kristy, it is an actual dessert from the Titanic’s first and last voyage. I’m looking forward to the party in April. I can’t wait for peach season. Oh wait, yes I can. It’s hot. Hooray for jelly 😀 I never made jelly from scratch before – only from a packet of cubes which you dissolve in water – and you know, I know people who refuse to eat jelly because they say it’s “kids’ food”.. – these are the same people who don’t eat mashed potato citing the same reasons. I say “pfft” to that. Thanks Charles. The Chartreuse was really surprising. “Impress” is a good word for this dessert, Eva. Everything about this post is impressive and I’m sure your dinner guests will really enjoy it. Personally, I’m shocked that you could find peaches — make that “edible peaches” — this time of year. What a find! Thank you very kindly John, I am quite flattered that you think so. The peaches were only edible because they were poached; I might have resorted to canned peaches had I could not find these. I am hoping that somewhere in the world in April we will have better specimens! Thank you so much Charlie. The glasses are from my MIL, from her wedding crystal (they married in 1952). They are actually drinking glasses. The set is pretty mismatched, but I will be able to get at least 5 of one size and 5 of another size for the actual evening. My Mom and Dad did not have much to hand down to me thanks to the 2nd world war, and that they left Hungary in 1956 (during the revolution), so I am VERY grateful that JT’s sister was not interested in the glassware and silver. I absolutely LOVE using everything!